Have you ever been watching the news and wanted to get a copy of a particular segment to play or embed online? While the latest DVR technology has made it easy to record television, it is not all that easy to get a copy of your recorded items for use on the Web. RedLassso, a Philadelphia-based search company, offers a service and search technology unlike any other I have seen thus far making it easy to search for TV and radio content to then clip and share on the Web. 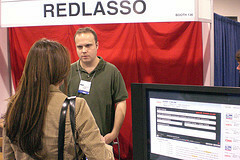 RedLasso offers a one of a kind TV and Radio search engine that starts by recording and indexing live television. Recording TV enables RedLasso to then index all the video while translating the voices to text. Searching for a particular term will return results from a number of networks. Users can then use the RedLasso video player to create up to ten minute clip from any search result. I searched for "free agency" on ESPN and found a clip about the upcoming baseball free agency pool. I have included the clip I created below though RedLasso also enables you to send it to a friend or directly link to it. I think RedLasso is a great idea as it offers a way for content producers to find and embed content that was previously not easily accessible. In talking with the RedLasso team at Blog World Expo this past week the first question I had was, "how is recording network TV for re-syndication legal?" but the RedLasso team assured me that they have been in talks with the networks with little or no negative feedback thus far. I also found out that they offer search based RSS feeds and APIs. I could definitely see RedLasso being used to create some compelling mashups! Check out the RedLasso demo for additional details and go RedLasso yourself some content to share today.